With less than four weeks to go before the UK is supposed to be leaving the EU on March 29 we still don’t know what is going to happen. The only good news is that we should at least know where we do stand by March 14 as a series of MPs votes in the House of Commons next week will determine whether we accept the Prime Minister’s proposed EU deal, accept leaving on a no deal, or ask the EU for an extension to the leave date. Here we set out what a no deal Brexit will mean – and cost – in terms of importing wine from the EU. Leading economists have been warning about the dangers of a no deal Brexit for months and last week we discovered for the first-time what implications and cost it will have on the UK wine industry. It’s particularly bad news for an industry already having to cope with an increase in duty levels last month. Even Andrew Lloyd Webber or Tim Rice might struggle to get a West End hit out of the 900 plus days that we have had to endure the political non-drama otherwise known as Brexit. Mind you it’s quite hard to squeeze any kind of tension out of high powered people getting in and out of chauffeur driven cars only to disappear into faceless buildings with other high-powered people doing exactly the same, only from a different country, identified by the fact the flag is different on the car’s bonnet. In what is otherwise known as the “Brexit negotiations”. But with only 25 days now to go before we – on paper at least – officially leave the European Union things are starting to get a little, well, sweaty. In fact you could almost imagine the dry ice being pumped into the floor of the House of Commons last week when the Prime Minister Theresa May stood up to announce the next vote that Parliament will have on whether to accept her deal to leave the EU. Was it just me that could hear the opening chords of Europe’s Final Countdown starting to build up as she declared March 12 would be the day when MPs get the chance to have their final vote on her supposedly re-worked deal with the EU. Only for the music to fade as she then went on to say that there could actually be multiple ‘Final Countdown’ votes next weeks, which could ultimately see us crash out of the EU with the dreaded no deal. Just like That. If only Tommy Cooper was still with us to tell us so. But can Theresa May’s last throw of the dice finally get her deal over the line and convince enough of her back benchers and wavering Labour MPs to back her? Next week could at least get exciting, if your idea of fun is watching MPs walk in and out of the chamber to vote and then waiting to find out if the “Ayes” or “Nos” have it. That said if they ever do a West End Brexit Musical they should make the Speaker John Bercow top of the bill. All eyes will be on the House of Commons next week for the final crucial Brexit votes. If you have had other things to do, here’s where we are with that whole “the Brexit” thing. The fun all starts on March 12 with an initial House of Commons vote on May’s re-worked deal. If it passes then all bets are off and the UK will leave the EU on March 29 as planned. Cue the music. But the fact there are already plans in place for subsequent votes shows how little confidence Theresa May has even in her own chances. If the vote on the deal is defeated on March 12, MPs will then be asked to vote the very next day on whether they are prepared to leave the EU with no deal – even though by collectively triggering Article 50 all those months ago they effectively did that anyway. Only they did not meant to. If they somehow agree that they would like to see the UK leave the EU with no deal then, again, we will be on our bikes on March 29. But, if MPs vote against a no deal then the only option available will be to come back the next day, March 14 (keep up at the back) to vote on delaying Brexit and extending Article 50. If that gets the thumbs up then Theresa May will then have to get back in her chauffeur-driven car and go ask the EU for an extension that she promised she would never would do. It would then be up to the EU to see if it is willing to do so. That said if MPs vote on March 14 against delaying Brexit, then the UK would leave the EU with no deal. Confused? Where’s Columbo when you need him? But at least by March 15 we will know where we are, even if that means we are in exactly the same place as we are now. But what we do now know are some of the ramifications of what will happen if the UK does end up leaving the EU without a deal – and they do not make for good reading if you are exporting wine out of the EU into the UK. The UK main drinks trade body, the Wine & Spirit Trade Association has revealed this week that in light of a no deal every consignment of wine destined for the UK from the EU could be faced with paying to get a laboratory technical analysis of the wine to comply with new regulations – a cost some fear could be £100 a go. An analysis that would have to cover seven criteria: dry extract; total and actual alcohol strength; total acidity; volatile acidity, citric acid and Sulphur dioxide. The move, says the WSTA, could cost the UK wine industry £70m alone, plus whatever fees producers in Europe will have to pay. It effectively means all wine from the EU will be faced with the same restrictions that the EU currently places on all wine entering the EU from outside countries. Make sense? Namely each wine has to be accompanied by a Vl-1 form. The same will also apply to all wines leaving the UK for the EU. The WSTA also claims each Vl-1 form could cost up to £20 each to process and create a bureaucratic nightmare for customs officials who might be faced with over 600,000 additional forms to handle (500,000 forms for EU to UK wines and 150,000 forms for UK to EU). It is estimated it would take 12 full time wine inspectors a year to process all these new forms. The hope is Defra, the government department tasked with managing the movement of food and wine products in and out of the UK, might be able to negotiate some concessions. Australasia, the US and Chile have all, for example, negotiated a simplified version of the Vl-1 form that speeds up the process, but the proposed system will be familiar to producers in New Zealand, Argentina and South Africa who already have to submit a lab test with their Vl-1 forms. The WSTA’s Miles Beale has consistently lobbied against a no deal Brexit outcome. If not the WSTA fears wine officials “will find themselves drowning in paperwork” and UK wine businesses “will be facing a catalogue of extra costs” that can only be passed on to consumers. EU producers could also be asked to pay up for lab costs to do business in the UK. As the Brexit stakes get ratcheted up a notch or two the WSTA has been holding talks with leading UK importers and distributors about the necessary steps they should be taking to prepare for a no deal. It is urging UK wine businesses to up stock levels by at least 20% in order to have the right volumes of wine on the right side of the Channel in case of a no deal Brexit. It has also written to three key Secretaries of State – the Chancellor Philip Hammond MP, Dr Liam Fox,Trade & Industry and Michael Gove at Defra – urging them to do all they can to minimize the impact of no deal by setting a zero rate of tariffs on wine coming into the UK from the EU. Ideally permanently. The WSTA has also called on the Secretaries of State to look at what certification process will be required for EU wine post-Brexit and if it could postpone introducing the new V1-1 proceeds in the short term, and keep open the current automatic EMCS (Excise Movement and Control Scheme) that allows goods to go through UK and EU ‘duty suspended’. It has also repeated it’s call for the government to introduce “a temporary suspension on all wine tariffs until the end of 2020 in the event of a no deal which would massively reduce the strain on the supply chain”. “In the longer term, there should be a re-evaluation of import controls to ensure that any future requirements for documentation are both fit for purpose and proportionate,” claims the WSTA. The challenge to be ‘fit for purpose and proportionate’ could well be applied to the Brexit negotiations in general. 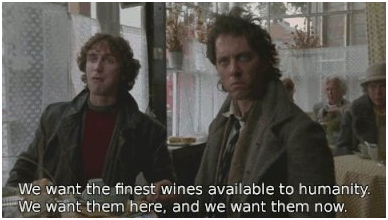 Let’s all get drunk on Fine English Wine for the foreseeable future. Instead of the European, Overpriced, Over Rated, French – German &Italian Stuff!! !